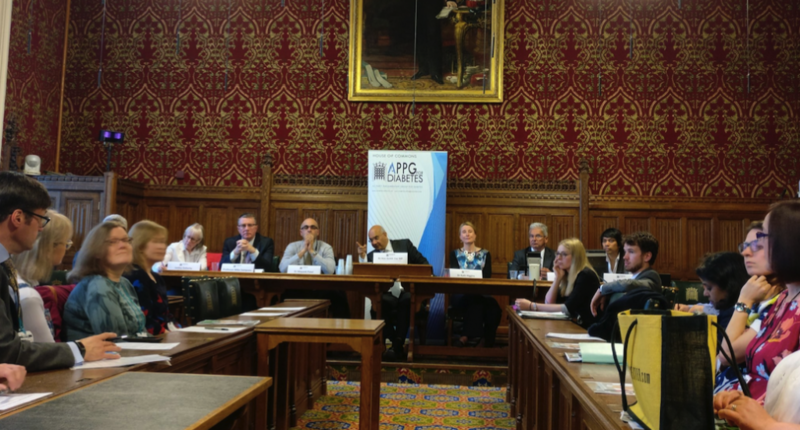 The future of diabetes care in hospitals was top of the agenda at the latest All-party Parliamentary Group (APPG) for Diabetes meeting. According to the APPG, one in six hospital beds is taken up by someone who has diabetes, but the organisation wants to lower numbers. It is thought that poor staff training and management of the condition during a patient’s hospital stay contributes to further diabetes-related complications, which takes up much needed beds for longer. A series of people gave evidence during the meeting, including Lesley Doherty, who has type 1 diabetes, along with Dr Gerry Rayman, who is the National Diabetes Inpatient Audit Lead, and Dr Partha Kar, who is the Associate National Clinical Director for Diabetes at NHS England. The APPG for Diabetes will now produce a report stating what it thinks can be done to improve diabetes care for people in hospital. A report has just been published which has focused on the safety and inclusion of children with long-term medical conditions at school and how problems with monitoring them can be addressed. The chair of the APPG for Diabetes, the Rt Honourable Keith Vaz, wrote in the report: “Since children spend a third of their lives at school, being able to manage their condition well whilst there will have a positive impact on their health, avoiding complications that will cost the NHS in the long-term. issues around children with long-term medical conditions, such as diabetes, in schools and how they can be addressed. At the last APPG meeting, evidence from more than 300 healthcare professionals, children with diabetes and their parents was heard. More than 300 children, healthcare professionals and parents provided written evidence to help the members of the organisation compile the recommendations. APPG members have said that common safety risks within school are going unnoticed regular which means children with medical conditions are being left “unaccompanied and untreated during an emergency”. According to the report only 11.5 per cent of schools can demonstrate that members of staff have adequate policies in place to help support children with medical conditions. Another parent called Emma, whose child has type 1 diabetes and coeliac disease, said: “His school did not have a medical conditions policy in place when he was diagnosed in 2015. The school was not even aware of the duty. I had to fight to get a healthcare plan in place. For eight years another parent told the committee how she had visited her child’s school at lunchtime for eight years to measure blood sugar levels. The recommendations which have been published to improve care in schools include leadership from the Department of Education in the increase of awareness of medical conditions in schools. It has also been suggested that Ofsted should start monitoring medical condition policies in schools as part of its routine inspections. The APPG for Diabetes is a group of Members of Parliament and Peers with a special interest in the issue of diabetes.